An article at The Wall Street Journal is causing quite an online uproar. In “Why Chinese Mothers Are Superior,” Amy Chua, a professor at Yale Law School, details how strict she was with her daughters, and contrasts it with the American (i.e., white) way that today’s parents cajole and pamper their kids, to the children’s own detriment. She’s clear to say that American parenting styles are just “different,” but the data show that whites are definitely falling behind Asians in terms of academic and economic success. Chua’s arguments certainly have flaws. For example, her version of “better” seems to mean simply producing children who are academically and musically talented. She discounts sports, drama, and socialization, and makes no mention of spirituality. Many commenters pointed out the detriments of such a program, citing a lack of creativity and originality in art among people who focus solely on technics. Chua also plays into the successful Asian stereotype, not mentioning Asian gangs or the achievement levels of the general populace of her home country, and by presenting an image of all Chinese students as A students who are musical geniuses. But the article does a great job of pointing out what incredibly low standards whites now have for their children, even among the middle classes. There are numerous reasons for these lowering of standards. The rise of egalitarianism, coupled with the loss of any true aristocracy in Western countries, has brought everyone down to the lowest (or at least middle) level. Very few whites with gifted children can afford to send them to specialized boarding schools, and instead rely on “gifted” program in public schools, which have an academic rigor far below that of our ancestors. Just as blacks are ridiculed for “acting white,” white students are ridiculed at many schools for being nerds or for not devoting massive amounts of time to social activities and fashion. The Chinese, based on Chua’s description, effectively counter such forces by being excessively strict by today’s standards and insisting on their children’s success. She recounts how an American woman broke down in tears when Chua mentioned some of her techniques. Chua also discusses how much time American children spend on sports (rather than music or academics). As such, it can be argued that the great success and stability of whites in America is very much a part of its downfall. Our people’s sports used to be tied into survival. Men had to be skilled warriors in fighting, fencing, and shooting for their own survival and that of their homeland, and to be considered a true man. American children today know only how to “play” sports, “fight fair,” and not be a “sore loser,” with no corresponding sense of honor or loyalty. In addition, the high standard of living in the West has allowed protection to be hired out, so that there is no longer any army that protects white interests. Such flattery is the opposite of the attitude of the Spartan mother, who told her sons to come back with their shields or on them. This type of love also is not a “sublime” function of motherhood, since, as Evola points out, it is something shared with the instincts of various animals (Eros and the Mysteries of Love, p. 170). Chua mentions a Western adult woman, who was ashamed when her father toasted her as “beautiful and incredibly competent,” obviously feeling she did not live up to the distinction. This sentimentality is a sign of the degeneration of the ideals of white parents, who are capable of esteeming even the unworthy. Such an attitude ultimately has a negative impact on white children, since it encourages them to view mediocrity as acceptable. In contrast to Western parents, who want learning to be “fun,” Chua notes a study that found “the vast majority of the Chinese mothers said that they believe their children can be ‘the best’ students, that ‘academic achievement reflects successful parenting,’ and that if children did not excel at school then there was ‘a problem’ and parents ‘were not doing their job.’” Whites certainly have the IQ to excel (and do so above many others), but the study reveals a deeper sense of family responsibility among the Chinese than whites. Although white parents may wonder to themselves what they did wrong when their children take drugs, act like spoiled brats, or are unsuccessful, family honor and shame are almost meaningless to whites today. I have heard white mothers say they don’t plan to bother with private schools or homeschooling, since “it’s no use” and “they’ll be exposed to everything through TV anyway.” Such an attitude is defeatist, and does not help children in the long run. Most white children also could be “the best,” but it will take a change in parenting techniques, and a realization that, like the Chinese, the “child will be strong enough to take the shaming and to improve from it.” As Chua points out, worrying about harming a child’s self-esteem does not improve it; what does is helping them achieve more than they thought themselves capable of. Published: January 11, 2011 | This entry was posted in North American New Right and tagged Amanda Bradley, Amy Chua, articles, education, egalitarianism, family, North American New Right, originals, parenting, sports, the Chinese, Traditionalism. Both comments and trackbacks are currently closed. Isn’t the contempt toward representatives of a systems that wants them dead and lies to them all the time a sign of intelligence? Chua and her supporters are two-bit psychopaths. “Specialized boarding schools”? We don’t need to send our children a thousand miles away so they can be as “smart and successful” as orientals. We need to keep them right beside us so they can learn through this closeness what it means to be White. Any skills and smarts they need aren’t attainable at Harvard and never were. I saw a little programme on teevee about Chua and Chinese mothers like her. The narrator pointed out that, by the way, these youngsters have a higher suicide rate. But hey, the ones who don’t kill themselves will go on to an elite university. That is sufficient compensation, isn’t it? Well? Is it or not? Can one properly be called a White Nationalist (or even a Nationalist) while at the same time renouncing his or her duty to become a Father or Mother? Is White Nationalism a silly game we play on the internet? Nationalism without children means NO NATION. Some things we can blog and harp on about on. Whether or not we should have big beautiful white families is not one of those topics. Make babies. Period. If a white “man” or white “woman” refuses to have children they have been thoroughly Niggerized into spirit-less consumers. They need to shut up and let the big people talk. Our Motherland – Europa – has become largely a vast wasteland filled with materialist baby-haters. Look at the depressing birthrates of these snotty bratty douchebags. That’s fine for those will-less losers. But, they need to get out of my face. They are part and parcel of the shapeless and definition-less masses who whine and riot when their government pensions get cut back. Unbelieveable. Greg, is right. Any excuse for not having children – especially the one about not being able to find a white woman who hasn’t race-mixed (give me a break) – is just that: A cowardly unheroic excuse. If my only choice was to have a bunch of children with a woman who dated Negroes then I wouldn’t hesitate to impregnate her. Children are everything. Period. I can’t believe this has to be explained to some people. I couldn’t call myself a real man without my two little girls looking up to me. Fellow fathers know the feeling I am referring to. A year from now my beautiful wife will be pregnant with our third child. That gives me hope and happiness. Consistently sacrificing for a human who shares HALF of your genes. What else is there? You see, I don’t complain and make excuses. I act. And because I act I remain proud and battle-ready. It is little wonder why white people are so frustrated, beaten-down and have such low collective self-esteem. We are the cause of our own genocide. Come on. Don’t be impressed by this silly propaganda piece. The original article by the Chinese woman is outright stupid (that someone like this can become a professor at Yale is a sad sign of the times). Her purpose seems to be to stick it to the Whithes that they are losing ground and that the Asians are gaining ground. But I don’t think that the parenting is a mayor factor for our decline. Her syle of parenting can be described as “parenting through terror”. She seems a mean spirited control freak. Perhaps one can get some results with this method with Asian kids but I don’t think we should emulate this method. 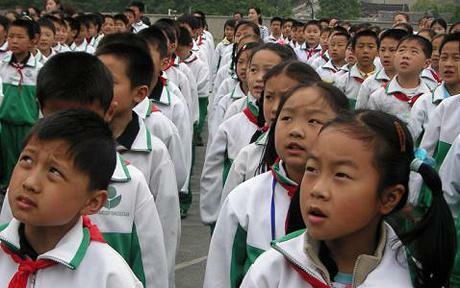 One should see that Chinese kids are quite robotic compared to White kids. European kids are more sensitive than Asian kids as many studies have shown. So good parents should take care not to destroy the souls of their kids. It is impossible to estimate how widespread and significant such sentiments are. First, it is bad form to express such sentiments, and those who have them might prefer to be silent about them. Second, such sentiments do not exist in a pure state, but are combined with others. Who can say how much of an individual or collective aversion to parenthood is due to pessimism as distinct from other factors? Is not the home front a war zone? I have long thought that the subject of high-investment parenting deserves more attention from White nationalists–Kevin MacDonald addressed it in The Culture of Critique in relation to the Frankfurt School–and I am pleased to see that Amanda Bradley has addressed it here. Having White children is not sufficient if they are not brought up properly. As the captain of the family I am not saying I don’t have my part in the difficulties we encounter, but I firmly put the blame on the usury system that suffocates all. Everywhere you go, whatever you do, you encounter it, and it sets the standards. However, having children and having for priority to raise them the very best one can is essential – failing this, there is no future. Amanda is a White Woman! Dear Amanda, thank you for your instinct and courage. Please develop more you WN women and help them to help the nation. You are a leader. If I had a dime for every childless White Nationalist I have met I would be able to buy a crappy little island and rename it “Whitelandia.” There we could all go quietly into extinction because we have lost our capacity to care about our genetic future. Too many racially conscious white people have chosen to become and remain Childless Weirdos harping about miscegenation and those damn “race traitors.” They spend their time ranting about how bad everything is and never take a moment to remember what is most important about us and our history: The White Family and by sacred extenstion the White Extended Family, i.e. Our People. Being a father and a mother is essential to becoming the heros our people so desperately need. I can’t believe we have forgotten something so simple but so true. There is no excuse for not having children. No excuse. I’m one of those childless WN men. The risk now is that when I see a girl with whom I might make a White baby, I have to first worry about how many blacks she’s dated and allowed to violate the White Holy of Holies. White girls are inundated with images of race mixing, and enough of them actually participate in the fad. The Diversity Mandate puts blacks in positions of authority, thus making them look powerful to White girls, and thus irresistible. Sounds like excuse-making to me. Most men make do without virgin brides. Your problem, high sperm count, is that you actually consider something about females of the modern era to be “Holy.” Women are not angelic avatars of Purity, especially today’s American White women, and if you go putting them on pedestals as many WNs foolishly do you will meet only disappointment and misanthropy. When I was 18 I very much shared your viewpoint. As I grew older, however, I realized that EVERY woman–regardless of how nice, cute, family-oriented, intelligent, and seemingly “pure” she was–has some really filthy skeletons in her closet. If you choose to write all White woman off as a result, you will be missing out on a lot of pleasure and happiness. If we could incorporate many of the techniques used by Asian parents, and heck, even Jewish parents (minus their disdain towards athletics), we would likely spawn future aristocrats. But because of our soft, liberal, permissive methods of parenting, and whatever else we have been doing for the last 30+ years, Johnny Smith is clogging the school toilets for a laugh and cursing at his math teacher while Sunny Chen is about to get an acceptance letter from Harvard. We needn’t write off every last characteristic of other races as “alien,” especially if its adoption could be beneficial to us. It seems drastic to say that “every woman–regardless of how nice, cute, family-oriented, intelligent, and seemingly ‘pure’ she was–has some really filthy skeletons in her closet.” Can you elaborate on this comment? What kind of skeletons do you have in mind? At the risk of being called an egalitarian, I think that women are just as bad as men, the differences being one of form rather than degree.